Fits any Shimano style thread-on freewheel and a standard 6 bolt bicycle disc brake rotor. Drilled for a 3/4 inch axle and includes a 1/4 inch mounting bolt. Disc brake mounting holes are tapped for standard M5 bolts. Our Delta Trike Axle FreeWheel Adapter fits onto any 3/4 inch axle and allows the installation of a standard Shimano style thread-on freewheel and bicycle disc brake rotor. With this part, you can add a pedal transmission to any trike or quadcycle using only standard bicycle components. 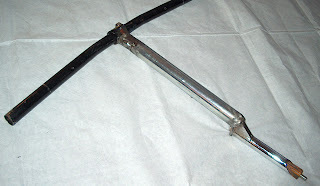 The included locking bolt secures the part to the axle and allows for easy removal at a later time. The 6 disc rotor mounting holes are also tapped so you can mount your bicycle disc brake rotor using the standard M5 bolts that were supplied with it. The FDAX34 Delta Trike Axle FreeWheel Adapter is a high quality machined part made of aluminum and anodized black. 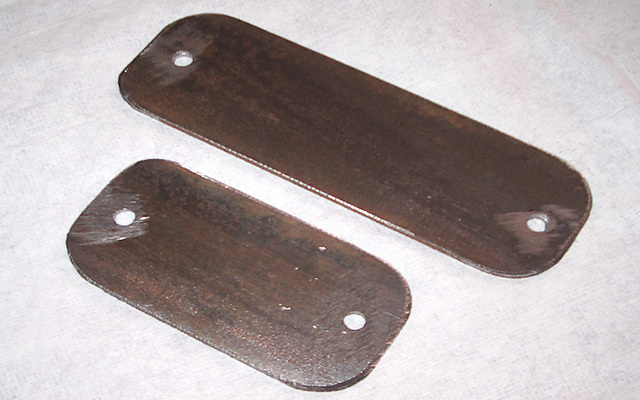 Fits any industry standard 6 bolt bicycle disc brake rotor. Drilled for a 3/4 inch axle and includes a 1/4 inch mounting bolt. Disc brake mounting holes are tapped for standard M5 bolts. Our Delta Trike Axle Disc brake Adapter fits onto any 3/4 inch axle and allows for the installation of a standard ISO standard 6 bolt bicycle disc brake rotor. With this part, you can add reliable disc brake stopping power to any trike or quadcycle using only standard bicycle components. The included locking bolt secures the part to the axle and allows for easy removal at a later time. The 6 disc rotor mounting holes are also tapped so you can mount your bicycle disc brake rotor using the standard M5 bolts that are supplied with it. The DBAX34 Delta Trike Disc Brake Adapter is a high quality machined part made of aluminum and anodized black. Now available for sale at AtomicZombie.com . Migrated from the old gallery to the new gallery. 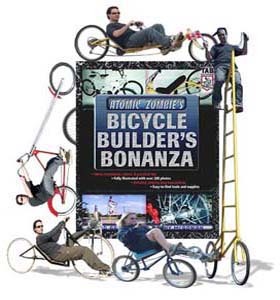 Check out this and other hand made lwb recumbents in the Atomic Zombie builders gallery. You can upload pictures of your own bikes to the gallery, too. It's free! If you're already a member of the forum, you can start uploading your pictures right now. If you're not yet a member, it takes only a minute to register. 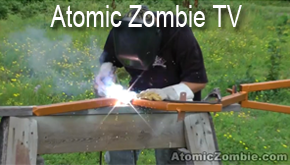 Welcome to the Atomic Zombie family! More than 150 tadpole trikes migrated from the old gallery to the new one. Check out these and other handmade bikes in the Atomic Zombie gallery. Submit pictures of your own bikes, too. It's free! 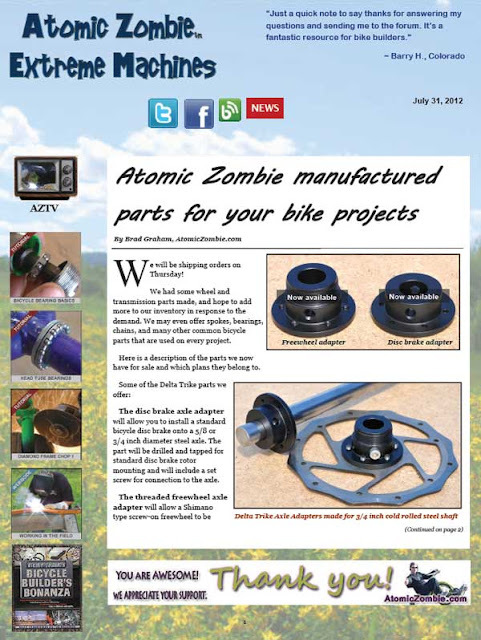 Victor Hugo shares some of his bike chopper pictures in the Atomic Zombie gallery. See more handmade bicycles in the builders gallery. You can post pictures of your own bicycles, too. It's free! See you there. 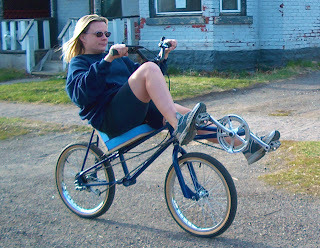 The School Bike. Hi There. 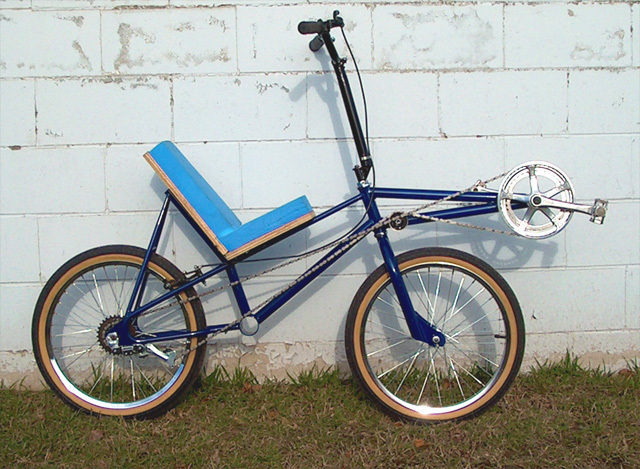 This is a TimberWolf converted to a Twins Schoolbike. We get a great reaction from everybody we meet with it. Thank you Brad for planting the seed! 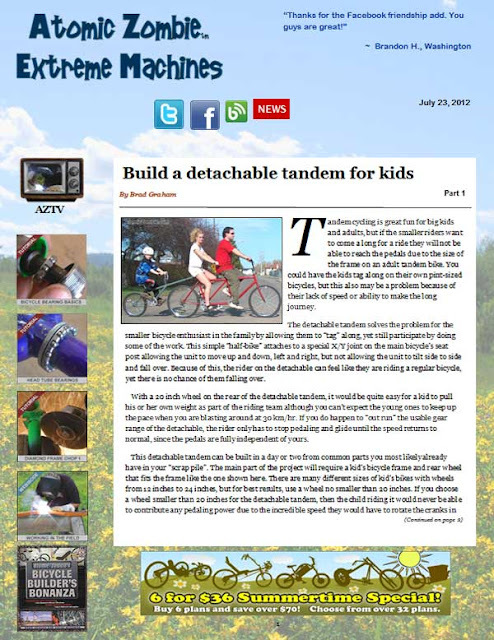 "Build a detachable tandem for kids"
Recumbent bicycles offer an aerodynamic advantage over upright cycles due to the reduced frontal area hitting the wind. You also have a massive strength advantage as you can now deliver the full power of your legs directly into the cranks as your back is pushed into the seat. On an upright cycle, you can only deliver as much force as you weigh, and any more will just lift you off the seat. Having the cranks so high from the ground also means that you can blast into corners without slowing down or worrying about where your pedals are. The only limitations on the corners will be your tire traction and courage to take them at full speed. 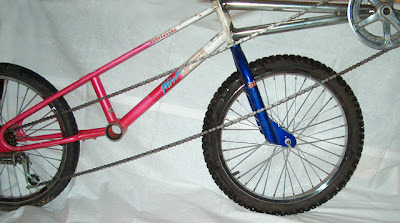 For information on chain joining and sizing, see the tutorials section on our main web site. When sizing the new chain, set it on the largest front chain ring and on the middle rear chain ring and then make it long enough to pull the derailleur into the position shown in the photo, with the top idler wheel just over top of the lower idler wheel. 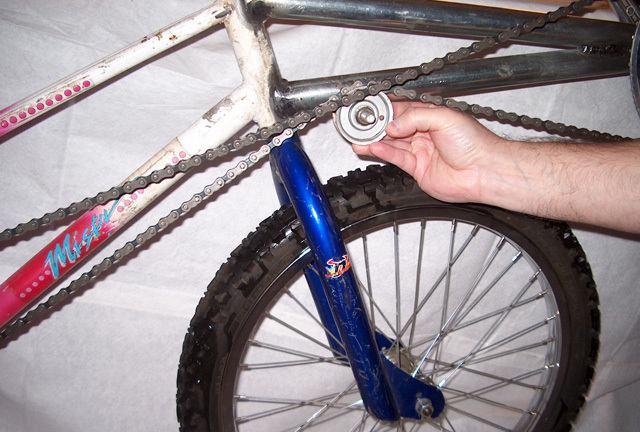 You will also notice that the chain is in the way of the front wheel, but this will be fixed with the installation of the idler pulley. The angle of the seat is completely up to you. Anything from 25 degrees to 35 degrees (taken from the horizontal ground) will work. 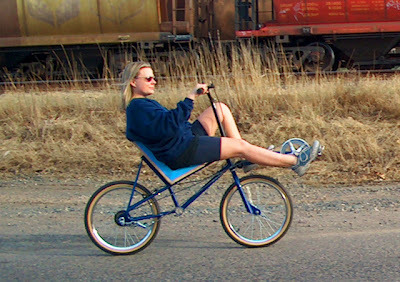 If you lean your seat back too much, you will have to hold up your head, and if you set your seat to far forward, your knees will have to bend a lot while pedaling. 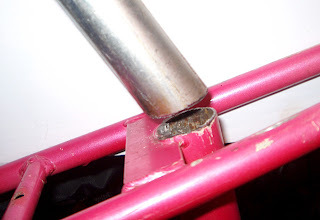 Try a 30 degree angle and make only tack welds on the seat support tubing until you can sit on the frame and see if you like the angle. On a project like this, it is easy to make adjustments, and since your frame parts will differ from the ones I used, you will need to experiment. 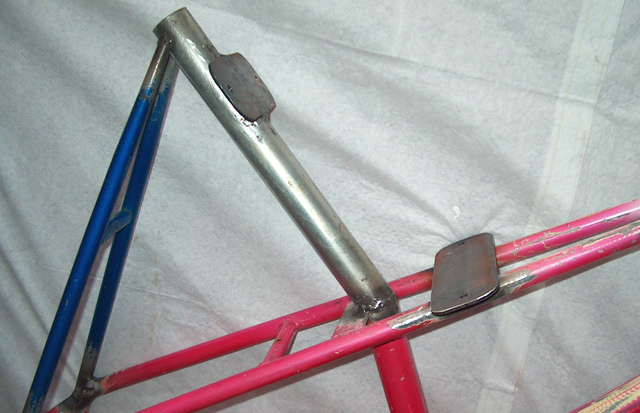 To support the seat, the 12 inch long seat tube is welded to the top of the cut-off seat tube and then braces with any small tubing such as a seat of seat stays cut from another old frame. When you are testing your seat angle, you can get away without the bracing as long as you don't put any hard pressure against the back of the seat. 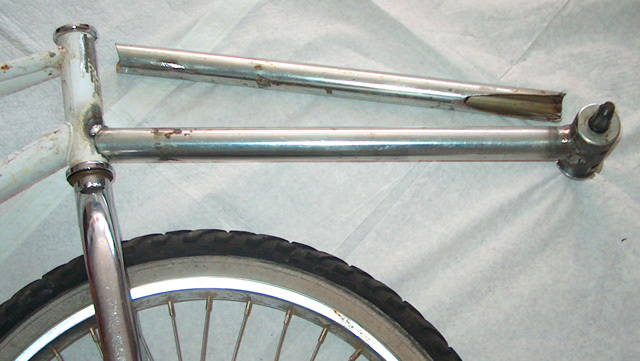 For riding though, you will definitely need the seat tube bracing. The seat will be held to the frame by a set of tabs that have holes drilled for woodscrews. 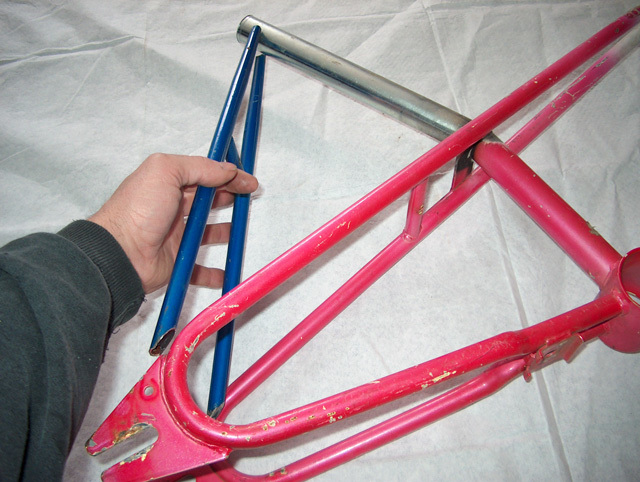 Any 1 inch wide 1/8 inch or similar flatbar can be used to make the seat mounting tabs, and they are made 6 inches long so that there is about 3 inches of material on each side of the frame tubing to mount the seat. Weld the seat mounting tabs to the frame so that the woodscrews will fasten each part of the seat in the approximate center of each board. The seat mounting tabs are shown here welded to the frame so that each seat board will be held to the frame by a set of wood screws. If you are not yet sure of your final seat angle, then leave out the seat back support tubing until you have had a chance to sit on the frame and see if your seat angle is comfortable. 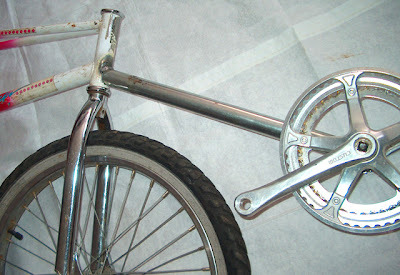 You could also make an adjustable seat back by hinging the seat back support tube and installing some kind of clamp that will allow the seat back support tubing to be moved along the frame and then locked into position. 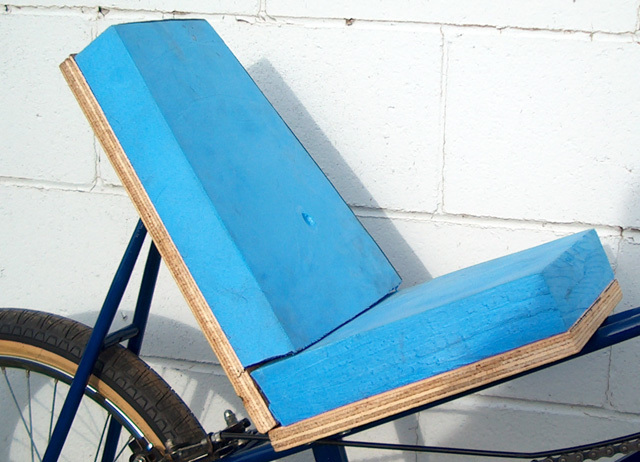 The seat is made of 3/4 inch thick plywood and foam as shown here. Feel free to make your seat any width and height you like, but for a reference, I like to make my seat base 10 inches wide at the back, 8 inches wide at the front, and 10 inches in length. I usually make the seat back 10 inches wide at the back, 8 inches wide at the top, and 12 inches in length. To further enhance the seat, another top section can be added to support your upper back, but for now, this basic seat will get you started. 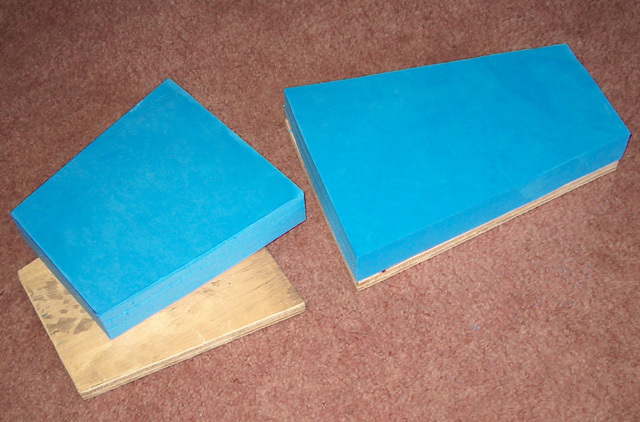 For seat padding, I use a firm 1.5 inch thick foam that has been cut to fit onto the plywood seat boards. You will need to install your seat padding before moving on with the frame design. Fasten the two seat boards together where they meet using a pair of bent L-shaped shelf brackets so that your seat becomes one single assembly. You can then glue the foam to the plywood using some spray adhesive. The shelf brackets will be strong enough to hold your seat boards together yet still allow some give if you want to force the seat into another angle later as you make modifications to your bike. Once your seat is made, fasten it to the frame by using the four wood screws through the seat mounting tabs installed on the frame. 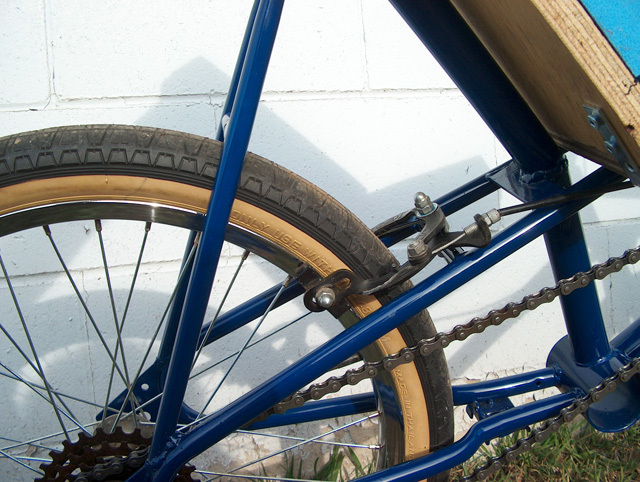 The main difference between this bike and a regular upright bicycle is the fact that the cranks are placed ahead of the front wheel rather than between the wheels. This recumbent position lets you push your full energy into the cranks and offers both a comfort and aerodynamic advantage over a regular bicycle seating position. 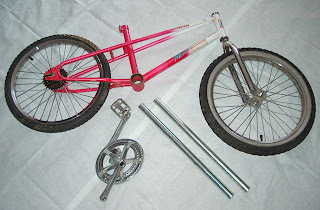 To get your cranks in front of the frame, you will need a set of tubes to create a triangulated boom and a bottom bracket to weld to the end of these boom tubes. Unfortunately, you can't easily remove the unused bottom bracket from your frame and transplant it here since it is holding all of your frame tubes together, so you will have to salvage one from another frame. If you have to choose between a bottom bracket for a single piece cranks set and a 3-piece crankset, then choose the threaded bottom bracket for a 3-piece crankset as these will offer the most selection when choosing a cranks set (see our crank and bottom bracket tutorials on the main page for more information). 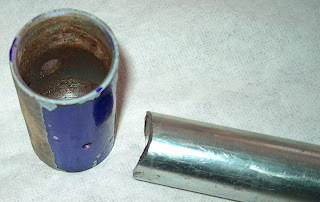 Clean up your bottom bracket shell with a grinder and then make a fishmouth cut on one of your boom tubes to conform to the bottom bracket as shown here. Before cutting the boom tube length, read ahead to see how the length of the boom tubing will be determined. Part 3 in tomorrow's blog. The other part shown in the photo is the bottom bracket and crankset that will be placed ahead of the front wheel. 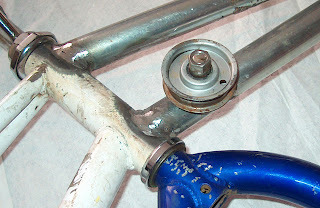 You can cut the bottom bracket from another frame since the original bottom bracket will be unused and left on the frame. For more information on bottom bracket sizes and assembly, see the tutorials on our main page. 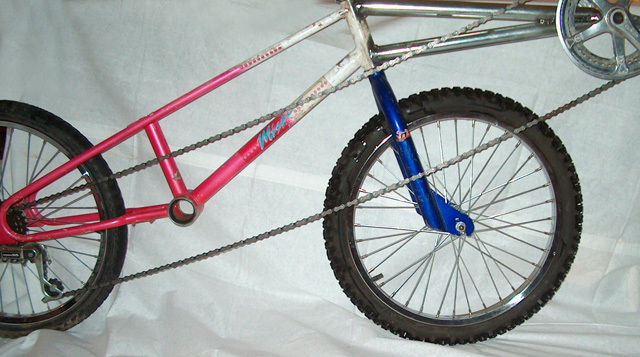 Here's a sample of some of the cool handmade bikes in the Atomic Zombie gallery. You can upload your own bike pictures, too. It's free! 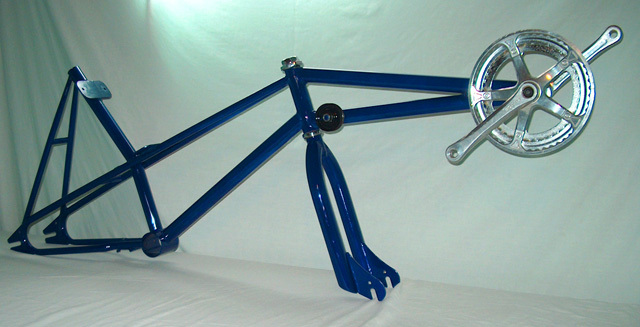 These and more cool custom bikes in the Atomic Zombie gallery. 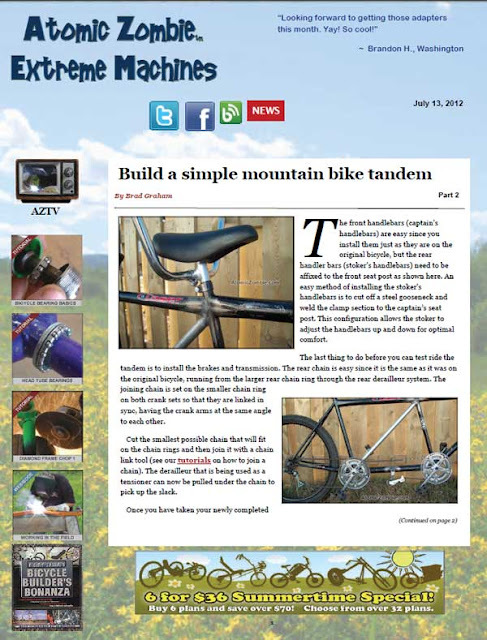 Choppers, gas powered, ebikes, lowracers, recumbents, cargo bikes and more. Check out these and other cool home built bikes from around the world.